Counseling 7 Edition Note: This is the bound book only and does not include access to MyCounselingLab®. To order MyCounselingLab® packaged with the bound book, use ISBN 0134297342. 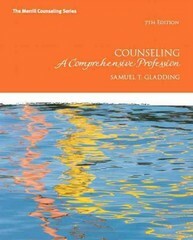 The most comprehensive guide to the Counseling profession available! Still the most readable, practical, and comprehensive overview of the roles and responsibilities of the professional counselor on the market, the seventh edition of Counseling: A Comprehensive Profession is updated and improved to meet the emerging needs of the developing counselor. Containing an even stronger emphasis on counseling as a profession and counseling as an identity along with new or expanded sections on history, wellness, trauma, social justice, multiculturalism, rehabilitation, motivational interviewing, bullying, microaggression, international counseling, process addiction, abuse, and ethical and legal issues in counseling, this text is more equipped to help students prepare for professional challenges and a lifetime as an effective counselor than ever before. New Features Include: More multicultural than ever, this text presents within each chapter the changing demographics of the United States as well as background and strategies for working in a diverse and multicultural climate. New graphic organizers present key concepts with visual cues, making important topics easier to grasp than ever before. New Chapter Learning Objectives as well as suggestions for reading help students study this text more effectively and with more focus. Also available with MyCounselingLab® This title is also available with MyCounselingLab–an online homework, tutorial, and assessment program designed to work with the text to engage students and improve results. Within its structured environment, students see key concepts demonstrated through video clips, practice what they learn, test their understanding, and receive feedback to guide their learning and ensure they master key learning outcomes.